You are at:Home»Air Conditioner»What Does It Mean If I Have A Leak in My Air Conditioner? What is an Air Conditioner Leak? Every year our technicians put hundreds of pounds of refrigerant into air conditioning systems. It is a common problem among all air conditioners. The real risk is that if a leak is not repaired or treated, it only gets worse. Your air conditioner is designed as a closed system that is engineered to grab the heat energy within your house and transport it outside and release it into the atmosphere. The medium which carries the heat is the refrigerant. A similar medium is the anti-freeze in your car. This medium removes heat from the motor and releases it into the surrounding air. In both cases, the medium is not consumed nor does it dissipate. So there should not be a loss of refrigerant or anti-freeze unless you have a leak in the pipes. One sign that your AC is leaking refrigerant is rusty coils. The rust is only on structural parts and is not the location of the leak, it is only a sign that your system has been running with a leak present. Leaks are cause by many different methods. The most common reason a leak forms is through weld joint fatigue. this is especially true for the evaporator coils in attics. 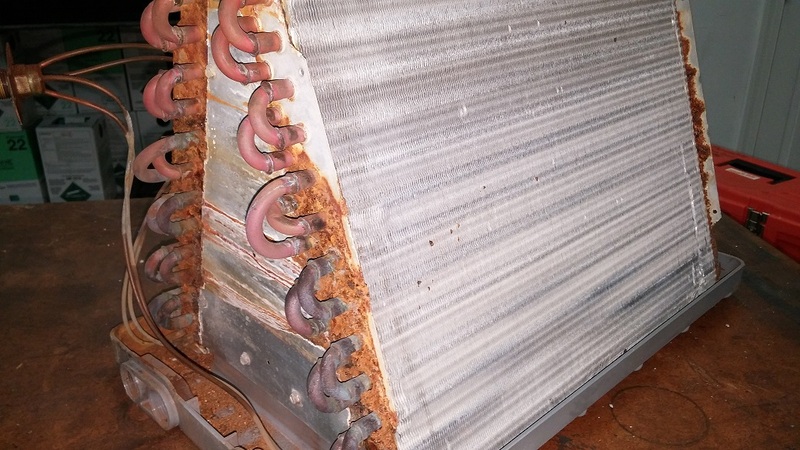 The coil goes from about 35 degrees when the air conditioner is running to 120 degrees when it is not running and cycles through these conditions over a hundred times a day in extreme conditions. This temperature change causes the metals to expand and contract during these changes. Every metal has different expansion properties and expand and contract at different rates. the pipe weld joints on the ends of the coils are made from two or more different metals. Thus the joints go through significant stress and strain as they try to expand and contract at different rates. These pressures create small microscopic cracks where the refrigerant can leak out. This is considered normal wear and tear on the coil. However most coils are designed to withstand these conditions for many years in most cases. Another type of leak was only discovered in the last 10 years. This leak is less frequent but still pretty common. 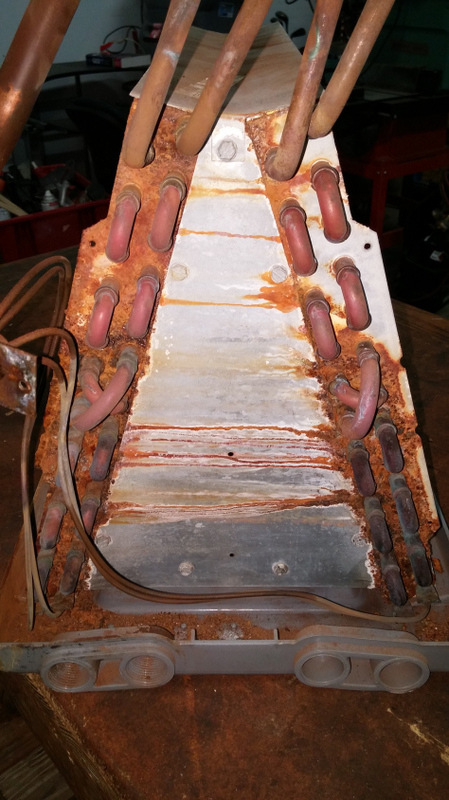 What Trane found out through one of their studies was that Formic Acid corrosion was etching through copper coils creating microscopic cracks in the copper tubing. Formic acid corrosion had not just all of a sudden become an issue, but a change in coil manufacturing made it more significant in the years between 2005 and 2010. During this time manufacturers were experiencing rising copper prices, so they turned to thinning out the copper to reduce costs. In doing so, the manufacturers had copper tubing that would withstand 20+ years of formic acid corrosion and ended up with copper tubing that could only withstand 3-8 years of formic acid corrosion. Since air conditioners usually died before they reached 20 years of age for other reasons, formic acid corrosion was never really noticed. To combat the formic acid problem, manufactures turned to coated coils, thicker copper coils and aluminum coils (aluminum is less susceptible to formic acid corrosion). Another reason for refrigerant leaks are poor installation and welding techniques. These can be avoided with proper training and practice. These are usually caught within the first year of the system installation. Finally the last reason for a refrigerant leak is from damage to pipes due to nails or screws through the walls that hold the line set. These are the most difficult to locate and repair as they are typically behind walls or other obstacles. Add refrigerant and hope it lasts. There is no guaranty with this option. A leak does not fix itself so the refrigerant will eventually leak out and you are back in the same boat a day, a week, a month, or if you are lucky, a year later. Add a leak seal treatment. This is also only a temporary solution. This option may be used with straight air conditioning systems as the sealant does not last long with heat pumps. I mention it as a temporary solution and should be considered a interim step before a more formal repair is performed. Fix leak. This step is expensive. If done properly, it involves removing the old refrigerant, welding the leak or replacing the part or coil, welding in a new filter/drier, pressurizing the system with nitrogen to check for welding leaks, placing the system into a 500 micron vacuum, then adding new refrigerant. This step can take between 3.5 to 5 hours depending on the part being replaced. The old refrigerant should not be reused because the leak has allowed contaminates into the system which turns the refrigerant acidic and can continue to erode the pipes from the inside out. Get a new system. Obviously this eliminates the leak because it replaces the entire system. It is also 3-5 times more expensive than fixing the leak. The choice between repairing and replacing really comes down to a financial decision about how long will it take to recoup your expenses. If a repair gets you 10 more years out of your current system then maybe you should repair the system. If a repair looks like it may only get you 1-2 more years out of your system or your system is very old, then probably replacement is the way to go. The unfortunate problem with leak repair is that it can get very expensive. Make sure that you chose a reputable company that has EPA certified technicians to handler the refrigerant. Do your research first. Go on line and read the company reviews, call friends for recommendations, and do not just call the first company you see with a number on a truck. Get someone with experience, good reviews and insurance. There are a lot of fly-by-night people out there who take short cuts that will significantly shorten the life of your air conditioner and you would never know. With new systems, make sure the installer is licensed in your state. Most states require new installations to be permitted and inspected which requires a license. Most importantly, do your homework. The lowest price may not be your best choice.